Many babies experience baby pimples on face. When this condition happens, their parents feel so worry because of it. Baby pimples on face looks like a condition that makes a baby feels sick. Is it serious condition that needs help from a doctor? Find the answer below. Every person can experience pimple, include baby. We know that a baby has sensitive skin. It may make a baby skin can be attacked by bacteria or germ, and finally causes a skin problem. How about baby pimple? Is it caused by bacteria? Actually, some experts said that baby pimples is common condition can be suffered by babies when the babies born. In their first 4 week or first month, pimples may appear as the result of hormone transferred from mother to baby during pregnancy. Hormone will accumulate with excess oil and also bacteria, and finally it causes baby pimples. 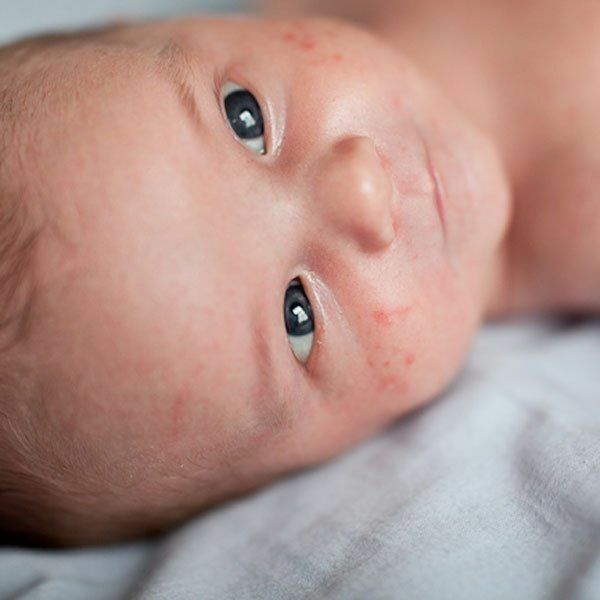 Baby pimples usually attack face area, especially cheek, nose and forehead. It looks red, but you can also see white and small spot on the pimple area. A baby that has pimples on face will be fussy and easily to cry. But in some cases, pimples on face will not bother a baby. So, parents don’t have to worry when finding baby pimples on face. Does My Baby Need Help From A Doctor? When you find pimples on your baby face, you may feel so confuse and also worry. Some of you may want to know whether pimples on face should receive treatment from a doctor or not. As mentioned above, baby pimples on face is common condition suffered by babies who are recently born. So, pimples on baby face included into normal condition. Although pimples on baby face included into normal condition, but you have to know how long the condition will happen. Baby pimples on face don’t need a specific medicine because it will go away after several months. But if the pimples don’t go away after 2-3 months, you have to consult it with a doctor. A baby that suffers pimples for more than 3 months may have acne problems in the future (when he or she is teenager or adult). A doctor usually knows the best treatment for baby pimples on face. Most doctors will give cream to solve baby pimples on face. The point is, don’t use a cream that is not prescribed by doctor. We know that baby has sensitive skin. Make sure you don’t use acne medicine for adult because it will cause skin irritation and make the pimples become worst. To prevent worst condition, you have to keep your baby face clean. You can use soft cloth to clean your baby face. You can also use baby moisturizer and warm water to clean your baby face. Finally, it will prevent worst condition of baby pimples. Avoid lotion or oil because it makes the pimples become worst. Be patient and don’t rub the pimples, and finally baby pimples on face will go away gradually.